"This review was first posted on http://www.ArtsBeatLA.com"
Led Zeppelin titled one of its songs "Rock and Roll;" author Laurence Carr, equally audacious, wrote a play with music in 1997 and called it "Vaudeville." Currently in its West Coast premiere at the Advent Theatre, "Vaudeville" honors Vaudeville's corniness and sweet-natured vitality while also alerting us to the form's pending demise. The story revolves around 11 Vaudeville performers who live in a Philadelphia rooming house in 1919; one year after the end of World War I, which much more than 9/11 "changed everything." Of all the famous American comics of the 20th century - team or solo - Laurel and Hardy were among the most gentle. They didn't rely upon crackling, and at times, mean-spirited witticisms to make us laugh, like the Marx Brothers, nor were they partial to the incessant slaps, pokes, and kicks that have enabled the Three Stooges to remain popular with successive generations of adolescent males. As for Lenny Bruce and Richard Pryor; did they and Laurel and Hardy even inhabit the same profession? Fulsome, apron donned moms do it. Cute diapered baby boys do it. Even chaste good nuns do it. Let’s do it! Let’s fall. Let’s fall. Let’s fall. At once dark, delicious descent into a pageant of gore, and luminous musical romp through the most ignoble archetypes inhabiting our collective image repertoire, playing late nights in the heart of Noho, writer-director Zombie Joe’s, Urban Death, drives the final stake through the heart of the mere notion that anything is or can be sacred - at least not anything ordained as such by the despicable creatures paraded before us in scene after lurid scene, creatures we can only recognize as us. Photo: Niki Nowak, Heather Roop and Shelby Janes. Taken by Jeanette Farr. Smart and sophisticated often go hand in hand when describing many artistic endeavors. 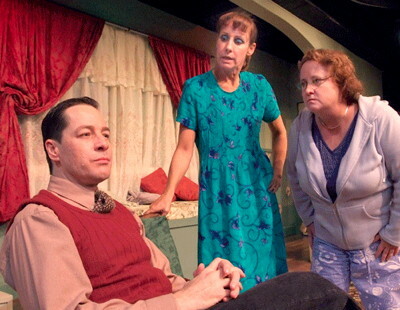 However, it is not an exaggeration when talking about the new play at the SkyPilot Theater Company in North Hollywood. This poignant and often humorous look at relationships from the female perspective is witty, charming and well worth seeing. It is an enjoyable and sometimes uneasy look at women who are ‘left behind’ when dreams, hope, and trust are shattered. The beautiful Theatricum Botanicum is the setting for Bill Bozzone’s comedy ROSE COTTAGES, one part of Theatricum’s enjoyable “Outdoors and Inspired” 2011 Summer Repertory Season. Zombie Joe's Underground presents their enchantingly gritty new production of playwright Zombie Joe's canon of mini-plays revealing love's wicked delights. Directed by Jana Wimer and Sebastian Munoz. Zombie Joe serves up a juicy, flavorful, and macabre mix of seven mini-plays. This format of perfectly portioned stories, each about the dark side of love, provides a Friday late-night treat for the theatre-goer. Two months ago, I saw BoomerMania at the El Portal Theatre. I loved it so much, I decided to see the show at The NoHo Arts Center where it is now playing for hopefully a sit down production. It is not often that I can say I smiled through the entire show especially seeing it for the second time. Many audience members were dancing in their seats just waiting for that one person to get up and dance in the aisles. Whether you are a baby boomer or not...If you like musical theatre, this is a show not to be missed.